In time for hot coco season Caribou Coffee is adding Guittard drinking chocolate to their menu. 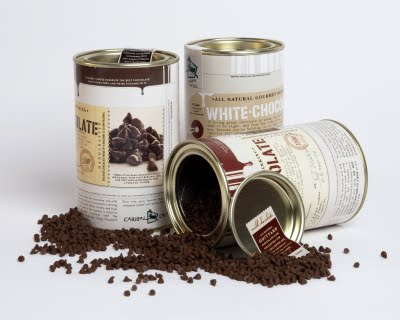 I'm more excited about the take home tins as I prefer to drink my hot chocolate in the comfort of my own home. If chillin' in coffee houses still floats your boat you can catch the launch festivities on November 27th where free samples and buy-one-get-one free mochas and hot chocolates will flow. Hey chocolate lovers! how about some free chocolate? I’m currently working for Kit Kat and thought I’d let you know that you can try the brand new Kit Kat Chunky Caramel for free! It’s just as delicious as the original Kit Kat Chunky but with a new fudgy caramel flavour…definitely worth taking a break for! All you have to do is log onto http://www.handbag.com/social/forums-general-chat_general-chat_want-chocolate-kit-kat-chunky-caramel and send us an email with your name and address and we’ll send you one to try - all that’s left to do then is to enjoy it! I just used this in my bialetti hot chocolate maker. this stuff rocks! Really? Although I have free cocoa beans I got from home my aunt gave me 3 weeks ago, I still have to get my hands on this great stuff. Have you already tried it? How did it go?